This is a stunning movie about a man’s life when he lives it by a code of honour. More specifically the code of the samurai. Starring Forest Whitaker, Ghost Dog is an urban tale about the Mafia and a very special kind of hitman who works for them. When a job goes awry, Ghost Dog (Whitaker), goes from being the hunter to the hunted and must do what he can to survive and keep his honour at the same time. 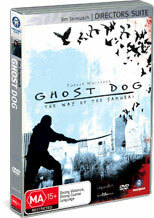 Ghost Dog follows the ancient Code of the Samurai and the movie tells a very human story despite the life that Ghost lives. We get to see Ghost as a person with the lives of his friends who eventually are affected by his past as his connection with the mafia unravels. Jarmusch has a very visceral style of storytelling that was the forebearer of a lot of today’s noir type style of movie with storylines coming in from multiple angles and finally converging with a flourishing dramatic finale. The quality of the video is quite good on this release and is fully complimented with a great soundtrack with music composed by the RZA of Wu Tang Clan. This soundtrack is also featured as isolated audio in the extras section. It’s worth listening to and is quite different from what you might expect from Wu. I would also recommend this film to those who might be considering checking out some Asian cinema as it’s steeped in Japanese ideals and synergies with the thrust of the movie being driven by Yamamoto Tsunetomo’s Hagakure. This is a brilliant movie with an ending that can’t fail to impress. One that is a great addition to your Madman Directors Suite collection.